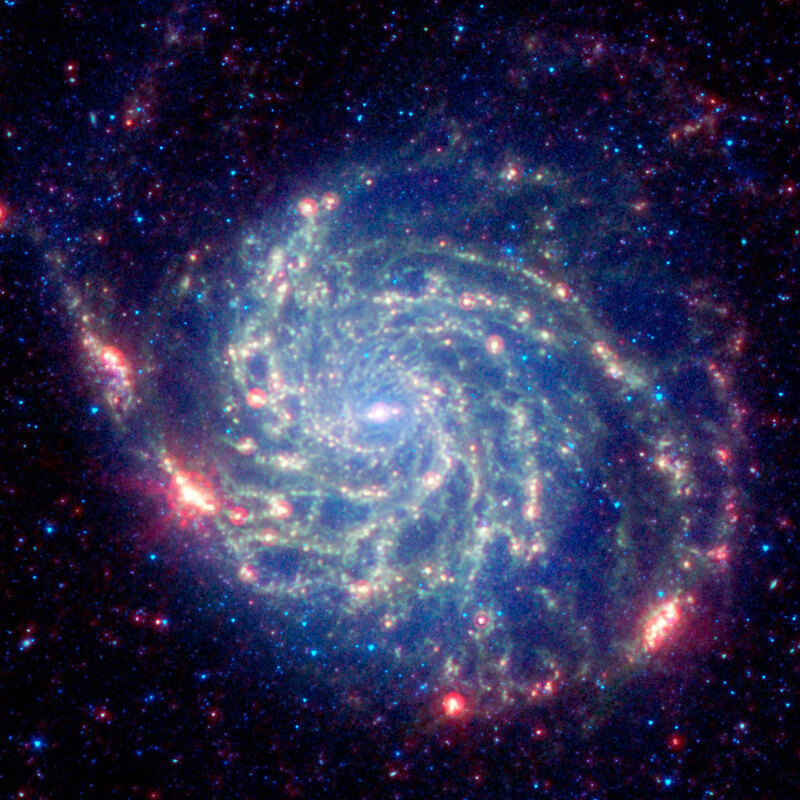 The Pinwheel Galaxy is a spiral-shaped galaxy about 21 million light years away from Earth. 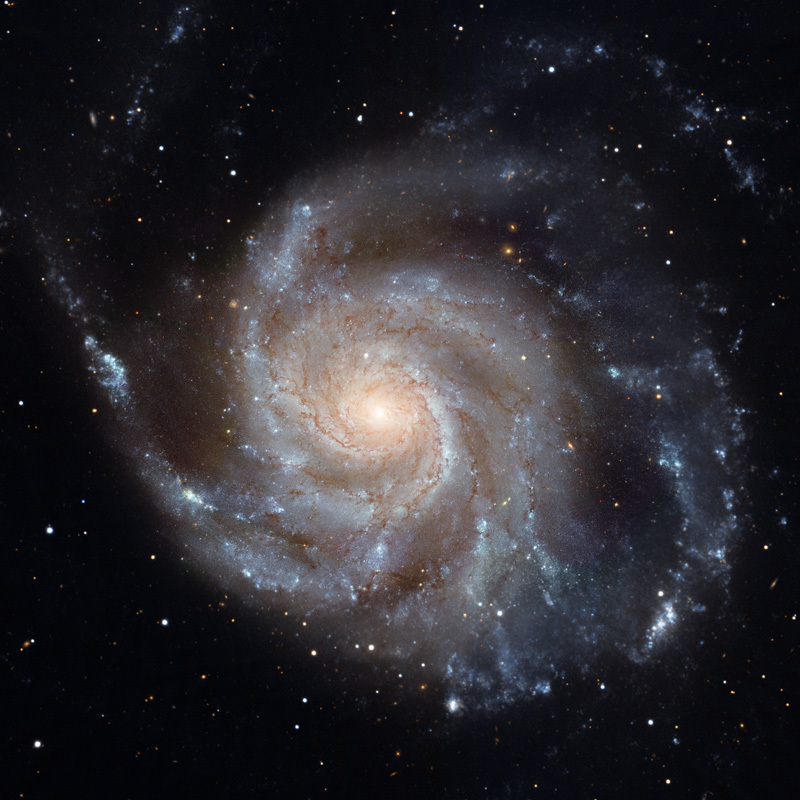 Scientists call this swirling galaxy M101. You can find it in the constellation Ursa Major, or the "Big Dipper," in the Northern Hemisphere. With a nice, dark sky, you can see it with binoculars or a small telescope. For those of us who can't see it in the night sky, we can have the next best thing: a Pinwheel Galaxy pinwheel! Cut out the hexagonal shape for your galaxy pinwheel. Cut along the white lines. Punch holes in the white dots: six around the edges and one in the center. You may have to fold the hexagon over to reach the center. Turn the paper so it’s face-down and thread the pipe cleaner through the center hole. Going around the circle, fold each flap so the pipe cleaner goes through the hole. Tie a knot in the pipe cleaner to secure the front of the pinwheel. Wrap the other side of the pipe cleaner around a popsicle stick. Don't make it too tight, or it won't be able to move. Blow on it and watch the galaxy spin! Download a PDF of this activity. Make sure the pipe cleaner isn't secured so tightly that it doesn't let the paper move. 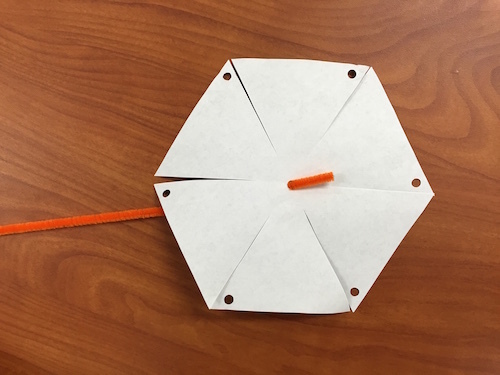 If the paper flaps are hitting the stick, flatten out the pinwheel on a table. Then carefully open each point from the front. This will let air in to move the pinwheel. The Hubble Space Telescope took this picture of M101 in visible light, the same waves that we can see with our eyes. The yellow core is made of old stars. The brown dust swirls are places where new stars can form. The Spitzer Space Telescope took this picture of M101 in infrared, which we normally can’t see with our own eyes. It gives us a different view of the dust swirls where new stars are forming. Dust warmed by hot, young stars glows in bright red at the edges of the galaxy. 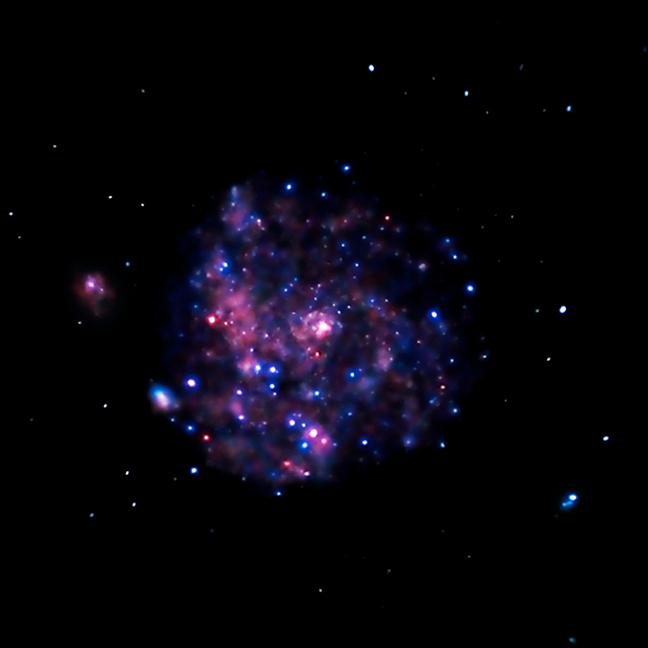 The Chandra X-Ray Observatory took this picture using X-rays, much like how a doctor uses X-rays to see your bones. This picture shows parts of the galaxy that are giving off X-rays. That means the pinks and purples show the energy given off by black holes, neutron stars, and the remains of supernovae explosions that release these X-rays.